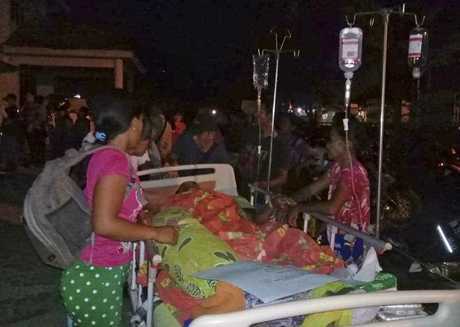 UPDATE: Nearly 400 people were killed when a powerful quake sent a tsunami barrelling into the Indonesian island of Sulawesi, officials said Saturday, as hospitals struggled to cope with hundreds of injured and rescuers scrambled to reach the stricken region. 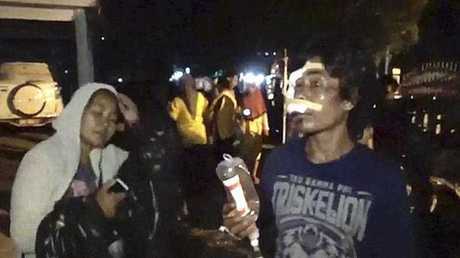 Spokesman Sutopo Purwo Nugroho told a press conference earlier today four hospitals in Palu reported hundreds were also injured. He said the fate of "tens to hundreds" of people involved in a beach festival in Palu when the tsunami struck was unknown. He said "many victims" were still to be accounted for. 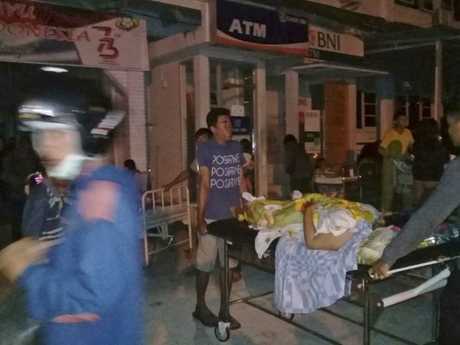 The coastline has been devastated in central Sulawesi where the 3-metre high tsunami - triggered by a magnitude .5 earthquake on Friday - smashed into two cities and several settlements. In Palu, the city of more than 380,000 people was strewn with debris from collapsed buildings. Photographs from Palu showed partially covered bodies on the ground near the shore, the morning after tsunami waves hit the city. EARLIER: Scores of people were killed when a tsunami and strong series of earthquakes brought down several buildings and sent locals fleeing their homes for higher ground. Rescuers are scrambling to reach tsunami-hit central Indonesia and assess the damage after at least 30 people were killed. But the death toll is still unclear. An Indonesian official said there were "many victims". One of the quakes triggered a three-metre-tall tsunami that swept away houses in at least two cities on the Indonesian island of Sulawesi. Disaster agency spokesman Sutopo Purwo Nugroho said the tsunami hit Palu, the capital of central Sulawesi province, as well as the smaller city of Donggala and several other coastal settlements on Friday. Photographs from Palu, home to around 350,000 on the coast of Sulawesi island, showed partially covered bodies on the ground near the shore, the morning after tsunami waves hit the city. INDONESIA'S geophysics agency says a powerful Sulawesi earthquake caused a tsunami, apparently after the agency lifted a tsunami warning. Indonesian disaster agency spokesman Sutopo Purwo Nugroho says the tsunami hit the provincial capital of Palu and another city, Donggala. "All national potential will be deployed, and tomorrow morning we will deploy Hercules and helicopters to provide assistance in tsunami-affected areas." He said in a live TV interview that houses were swept away and families are reported missing. At least one person has been confirmed dead so far. Head of Indonesia's Agency for Meteorology, Climatology and Geophysics (BMKG) Dwikorita Karnawati said a 1.5- to two-metre tsunami had receded. "The situation is chaotic, people are running on the streets and buildings collapsed," she said. "There is a ship washed ashore." The strongest of two major quakes had a magnitude of 7.5 and was centred at a depth of 10km about 56km northeast of the central Sulawesi town of Donggala. "It happened while we still have difficulties in collecting data from nine villages affected by the first quake," he told The Associated Press. "People ran out in panic." "Our early estimation, based on experience, is that it caused widespread damage, beginning from (the provincial capital) Palunorthward to Donggala," he told MetroTV in an interview. The area was hit earlier on Friday by a magnitude 6.1 earthquake that based on preliminary information killed one person, injured 10 and damaged dozens of houses. "The victim was hit by a collapsed building," the agency said in a statement. Donggala resident Mohammad Fikri said by telephone that he ran from his house but there wasn't great panic in his neighbourhood. "All the things in my house were swaying and the quake left a small crack on my wall," he said. "But this was not the first time. Last week we felt an earthquake that had a stronger tremor so this time we didn't panic,just avoided the buildings and now everything has returned to normal," Mr Fikri said. The disaster agency said the tremor was felt for about 10 seconds in Donggala. Indonesia is prone to earthquakes because of its location on the "Ring of Fire," an arc of volcanoes and fault lines in the PacificBasin.